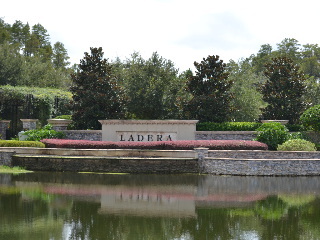 Ladera – A new upscale community in Lutz. Located just east of North Dale Mabry on Van Dyke Road, this gated 220-acre property consists of 168 single family homes which rest on 1/2 to 1 acre homesites. The homes are nestled around 20-acre Lake Merrywater, as well as conservation areas and ponds. It features’s a gated entrance, two parks, dock, fountains, and exquisite landscaping. Ladera features custom built homes by Taylor Morrison, David Weekly and Arthur Rutenburg. Ladera’s fantastic location near Dale Mabry creates close proxmity to Tampa’s fine dining, entertainment, casual restaurants, and shopping within minutes. Downtown Tampa and the airport are only about 15 minutes. Come Live & Enjoy Ladera Luxury.